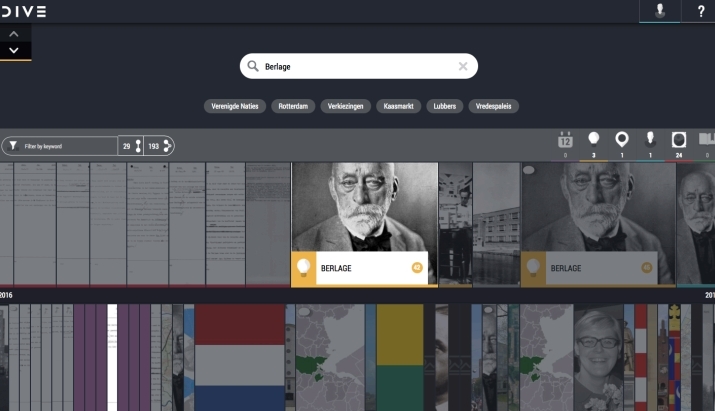 The DIVE tool is an event-based linked media browser that allows researchers to explore interconnected events, media objects, people, places and concepts (see screenshot). Maartje Kruijt’s research project involved investigating to what extent and in what way the construction of narratives can be made possible in DIVE, in such a way that it contributes to the interpretation process of researchers. Such narratives can be either automatically generated on the basis of existing event-event relationships, or be constructed manually by researchers. The research proposes an extension of the DIVE tool where selections made during the exploratory phase can be presented in narrative form. This allows researchers to publish the narrative, but also share narratives or reuse other people’s narratives. The interactive presentation of a narrative is complementary to the presentation in a text, but it can serve as a starting point for further exploration of other researchers who make use of the DIVE browser. Within DIVE and CLARIAH, we are currently extending the user interface based on the recommendations made in the context of this thesis. You can read more about it in Maartje Kruijt’s thesis (Dutch). The user stories that describe the needs of media researchers are descibed in English and found in Appendix I.